Homepage. 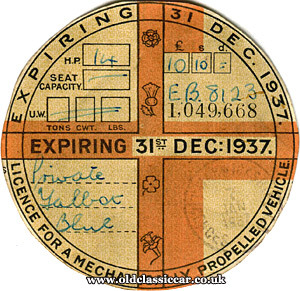 This page: Tax discs originally fitted to cars in the 1930s. Later tax discs, or road fund licences, feature elsewhere on OCC. This page though focuses on the pre-war discs, issued throughout the 1930s. In all I probably have 50 or so examples from this era, mainly for private cars but also a few suitable for hackney carriages, commercial vehicles, and even bicycles. Shown below is a selection, one from each year that I have a disc for (ie 1933 to 1939). What is apparent are the different styles of discs that were available during the period. The quarter-year, 3 month, discs are noticeably less colourful than those that ran for 6 or 12 months. With the ending of the road tax disc that took place in 2014, many owners of older cars are now taking the opportunity to adorn their car with a disc more in keeping with its age. 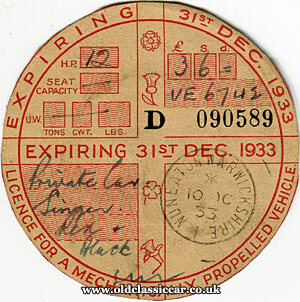 The first of my 1930s' discs expired 31st December 1933, and was placed into the windscreen of a red and black 12hp Singer car. It's registration was VE 6742, from a Cambridgeshire series, although at the time of being taxed it evidently lived in the Nuneaton area. As with most of the discs featured on this page, it has been cut out from the original border paper, or selvedge as its known. It was issued on 10th October 1933, and ran 'til 31st December. KV 9161 was a brown coloured 8hp Ford. Being a 1934 disc means the car was a Ford Model Y, a car in production from 1932 to 1937. Period photos of several Model Y Fords may be found on this page. This disc was sold to its new owner, for 10 GBP, in Coventry on May 12th 1934. Curiously, it was classed as both a Private and Goods vehicle, so maybe it was a van version. Another KV (Coventry area) tax disc, here KV 425, which was the registration for a 15hp Morris Oxford. A quarterly disc, it was purchased on 9th October 1935. The black Morris was thereafter road legal until the end of the year. This example is particularly unusual, not just because it survives at all, but because it was never removed from the surrounding selvedge. The border was simply folded back out of the way before being displayed on the 14hp Talbot for which it was purchased. The Talbot's registration was EB 8123, a Cambridgeshire number. 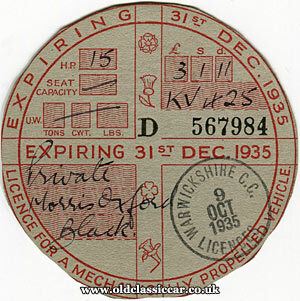 This tax disc, also for the aforementioned Talbot 14, applies to the following year - 1937. On this occasion the disc was cut out from its surroundings. The issuing stamp (7th January 1937) has faded quite badly. Being a full 12-month licence, so subject to daylight for a full year, it has faded more than a quarterly disc might do, which would see much less sunlight. 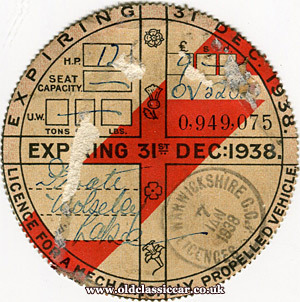 A 12hp Wolseley, registration OV 5232, was issued with this disc in Warwickshire, on 7th January 1938. The final disc for this page relates to a Rover 14hp (JU 4193), refinished in black and green. 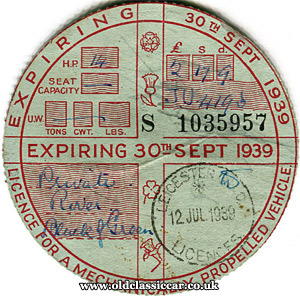 It was issued in Leicester on 12th July, and was set to expire on 30th September 1939 - a few weeks after the beginning of the Second World War in Europe. I wonder what happened to the car, and its owner(s), once the war gained in momentum? 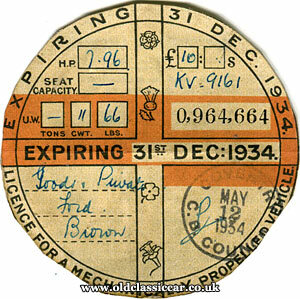 Scans of further old tax discs will be added to the site in time. If anyone is able to scan me a disc for 1930, 1931 and 1932, I'd appreciate seeing them to complete this page. 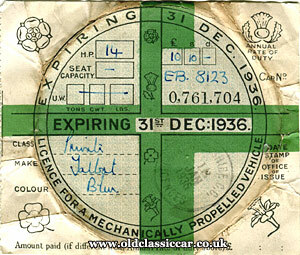 Return to the Motoring Collectables section, to read about other items of motoring ephemera. Also see: Car tax discs of the 1950s.